This month, MainSail reports on the Extreme Series Grand Prix in Istanbul. Here we present a waterfront guide to this timeless, vibrant city. 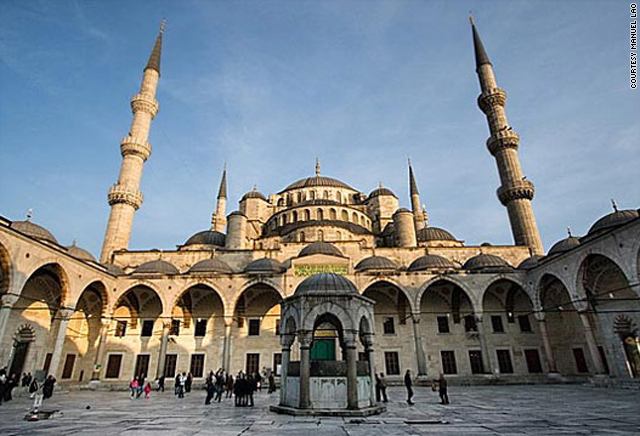 (CNN) -- With its jumble of Byzantine cathedrals, Ottoman mosques and contemporary tower blocks, Istanbul is one of the world's most historic cities as well as a clamorous modern metropolis. "Sit on a sunny day with a cup of sweet tea in one of the cafes at Seraglio Point, where old Constantinople meets the Sea of Marmara and you'll feel like you're at the center of the world," enthuses Hall. From here, within easy walking distance, there's a cluster of impressive cultural treats. First up, on the southern edge of the Istanbul peninsula, the Hagia Sophia, a "great basilica, turned mosque, turned museum," says Hall. After taking in the magnificent dome -- which is a full 30 meters across -- enjoy some shelter from the sun in the Basilica Cistern, as traversed by Sean Connery in the 1963 James Bond film "From Russia With Love" and described by Hall as a "subterranean wonderland complete with salvaged Roman columns." For over 400 years Topkapi Palace was the opulent epicenter of the Ottoman Empire. Explore the lavishly decorated courtyards, kitchens and ceremonial chambers, and imagine what life would have been like for a sultan and his harem. If the weight of history is all getting a bit much, make your way down to the Istanbul Modern, the first private museum showing modern and contemporary art exhibitions in Turkey, which Hall says is the city's "stand-out new cultural attraction." Occupying a former warehouse on the shores of the Bosphorus, it displays work from its permanent collection as well as organizing temporary exhibitions. Food is an obsession in Istanbul and there's something new to try everywhere. The ancient beacon, first built by Athenians in 408 BC, sits on a small islet in the Bosphorus just off the coast of Uskudar. Legend tells that a Byzantine princess was once confined to the tower by her father, Emperor Constantine, after soothsayers predicted an early death by snakebite. Sadly, the serpent still made it through in a basket of grapes and the princess duly perished, according to the fable. Since then, it has been transformed into an upmarket cafe and restaurant -- a favorite among young lovers and a regular source of income for the competing water taxis. "Food is an obsession in Istanbul and there's something new to try everywhere. Most shopping strips have a lokanta, a cafe serving a variety of hot, traditional dishes in a buffet style," says Hall. You can't possibly travel to Istanbul without sampling the sickly sweet but impossibly more-ish Baklava. Look out also for patisserie-style bakers selling it fresh along with Turkish Delight -- which they'll happily box up for you to take home -- and cafes who'll serve cheap fill-ups of tea and coffee. "If you ask for the latter, expect the thick, Turkish variety which can have quite a kick," warns Hall. "Stop for a Bosphorus fish served simply in a sandwich with a squeeze of lemon, served from a boat rolling on the waves."